Weighted Cup With Lid, 12 oz. 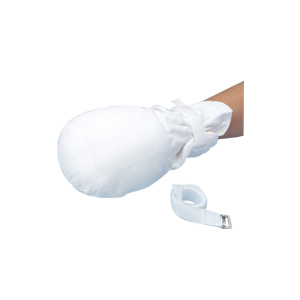 Double-Security Mitts feature a double hook and loop closure for added security. The palm of each Mitt is filled with machine-washable fiber fill and connecting straps are included to limit the range of motion, if necessary. No finger separators. Ambidextrous design fits either hand. One size model fits most adults. Machine washable.